Signs & Lines Graphic Arts, LLC is a full service, locally owned sign company. With more than 75 years of combined experience, we focus our efforts in maintaining the highest quality workmanship, superior products, competitive pricing and most importantly personal customer service. Our capabilities range from screen printing to fabricating virtually all types of signs. The list includes; dimensional lettering & signage, architectural, recognition plaques, illuminated signage, digital graphics, decals, banners, vehicle graphics, construction site signs and much more! Statewide our clientele include advertising agencies, real estate agencies,retailers,hospitals, manufacturers, utilities, state agencies and special interest groups. Let us put our experience to work for you! is to provide our customers with the highest quality in sign systems and special fabrications. We produce professional and cost efficient signs and are committed to our number one policy; CUSTOMER SERVICE. 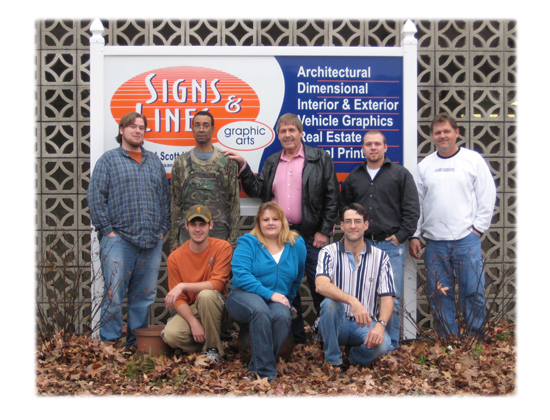 At Signs and Lines Graphic Arts, we design, manufacture and mass produce real estate signs, decals and much more. From our wide range of signage options, we will create and satisfy our customers by using the highest quality materials and the latest of sign technology. By using our professional sign staff, we can direct you to what you are looking for in our customized sign systems. Copyright 2010 Signs and Lines Graphic Arts. All rights reserved.